Two shipwrecks discovered 2,300km off the coast of Western Australia during the initial search for missing Malaysia Airlines flight MH370 have been identified as 19th Century merchant sailing vessels carrying cargoes of coal. The Western Australian Museum was asked by the Australian Transport Safety Bureau (ATSB) to analyse sonar and video data taken in international waters by the search vessels Fugro Equator and Havilah Harmony in May and December 2015. The work was undertaken by Dr Ross Anderson, Curator of Maritime Archaeology at the WA Museum. “Both wrecks were found at depths between 3,700 and 3,900 metres, roughly 36km apart. We used a combination of all of the data supplied by ATSB, historical research and maritime archaeological analyses to determine both wrecks were in fact 19th Century merchant sailing ships – one wooden and one iron – both carrying coal,” Dr Anderson said. Dr Anderson said the wooden sailing ship would have been in the 225-800 ton range. None of the hull structure or loose ship’s timbers were observed at the site, appearing to have totally degraded, leaving only the remains of the vessel’s coal cargo and metal objects such as fastenings, anchors and fittings. 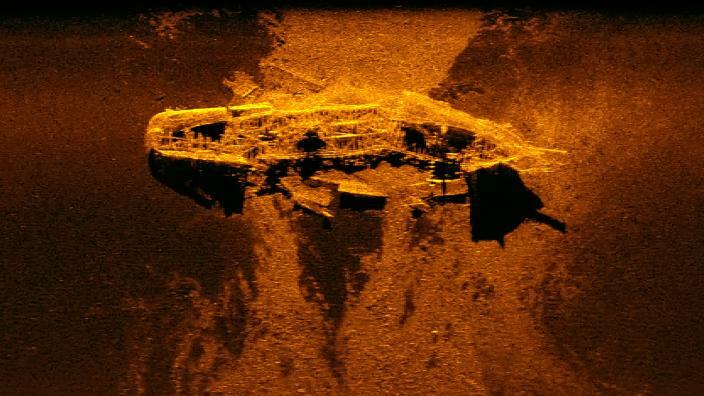 “Most of the material widely scattered on the seabed consists of the remains of the coal cargo that spilled out of the hull prior to it striking the seabed,” Dr Anderson said. “The evidence points to the ship sinking as a result of a catastrophic event such as explosion, which was common in the transport of coal cargoes. “Historical research into all 19th Century merchant ships that disappeared in international waters is incomplete so we cannot conclusively determine identity of the individual ships,” Dr Anderson said. “However, we can narrow the possibilities to some prime candidates based on available information from predominantly British shipping sources. Both ships are likely to have carried crews of between 15 and 30 men. Sometimes captains travelled with their wives and children on international voyages and both vessels may have carried additional passengers as well as cargo. “Then, as now, the disappearance of so many lives would have had a devastating impact on maritime families and communities,” Dr Anderson said.